Foucault’s Pendulum, by Umberto Eco, is based on two scenes Eco experienced in his life that stuck with him: a young boy playing the trumpet in a cemetery and the image of Foucault’s Pendulum in the nave of Saint-Martin-des-Champs in Paris. The book spins a tale that links those two images together -– a work of art that took him eight years to craft. 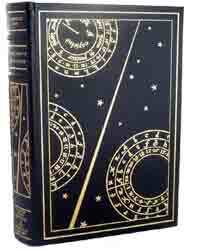 The novel is bound in full leather with elaborate 24K gilt designs on the cover and features an illustration commissioned especially for the book -– a handsome volume indeed.